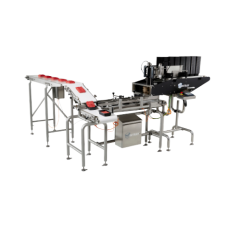 INTRAY Easy Loader is the solution when you want high volume, high speed denesting and automatic placement of a product in the tray. The Easy Loader requires very little space compared to the volume and output. The EasyLoader processes up 90 portions per minute. EasyLoader comes with a Smart Tool made for your tray. The control unit is built into the denester. We use stainless steel tubes wherever possible for easy cleaning and all wiring is run through the tubes to protect them against the harsh working invironment of a food production line. The INTRAY EasyLoader is completely automatic. No human hand is in contact with the product, yet again ensuring top level hygienic handling. Because we made the system modular, your plant technicians can replace any denesting spare part easily and be up and running within the hour. The servo driven denesting ensures perfect control of the denesting. Denesting does not rely on compressed air. Any part of the solution that is in direct contact with the trays can be easily cleaned. 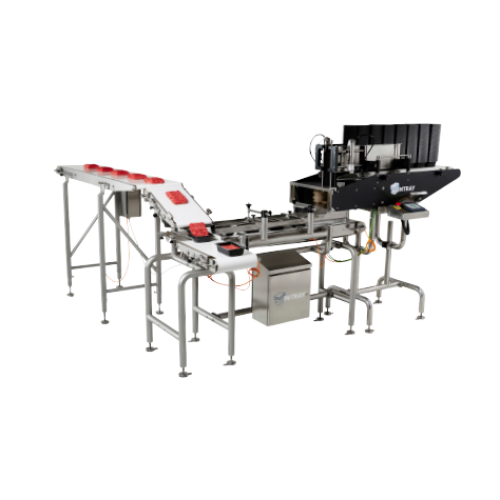 This is a complete, fast and clean solutions which will ensure a reliably high output of ready-to-seal trays with a perfectly placed product inside - fast, easy and clean.